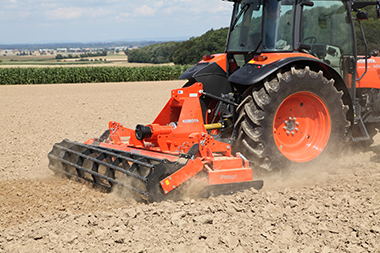 The Kubota PH1000 series are medium sized power harrows for tractors up to 140hp and designed for heavy conditions. Special emphasis has been given to reliability and a strong trough design. 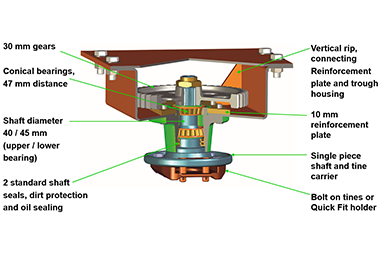 This has been achieved by having a large distance between the conical bearings, hardened gears in the trough and a heavy-duty rigid trough design. Ample clearance of 95mm between the trough bottom and the tine holder. PH1000 series: A 5mm profiled plate together with a 5mm top plate form the 120 x 400mm trough. In combination with a 10mm reinforcement plate, precise positioning of the rotors gives a light but strong bending resistant trough. 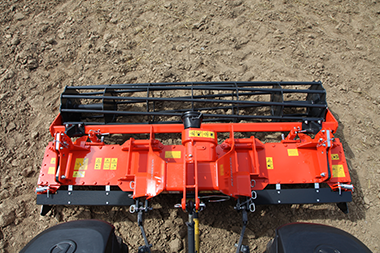 The “Pro-fit” active tine lifts the material and pushes it in front of the power harrow. This gives an optimum leveling effect even in tractor tracks. Helical tine positioning in order to prevent damage caused by stones and to ensure even leveling. This reduces also peak loads on the driveline and results in smoother running and less fuel consumption. 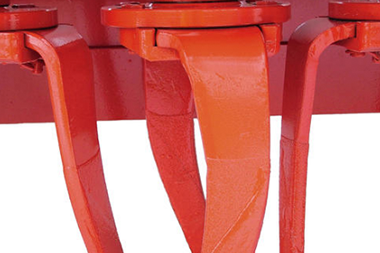 Quick-fit tines are simply fixed to the tine holder by a pin and a clip. 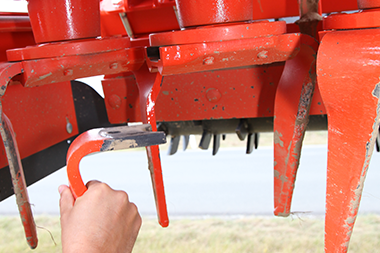 All tines can be quickly replaced without any tools. Down time can be minimised by carbide layered Quick-Fit tines. These tines ensure a long lifetime and minimum wearing even in tough and abrasive soils. These tines are available through Spare Parts. 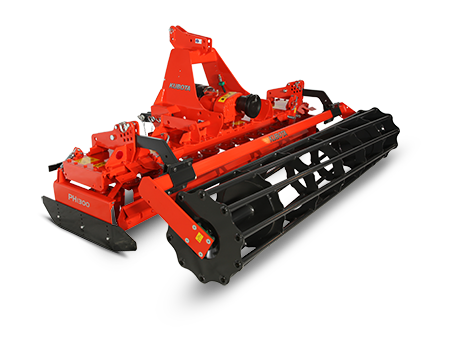 The range of rollers offers the right choice for all various soil conditions and crop establishment systems. Tooth Packer Roller dia. 585mm: medium to heavy soil, most versatile roller – especially as part of heavy power harrow/seed drill combination. Cage Roller dia. 550mm: light to medium soil and dry working conditions, basic variant: mainly for depth control of the power harrow.